Connecticut claims its share of Celebrity Chefs. These culinary artists routinely win Food Network Competitions, earn James Beard commendations, and enjoy (or endure) their roles as restaurant Rock Stars. Though less lionized, Chef Frederic Kieffer is every bit their equal. He created the exquisite l’Escale in Greenwich, followed by Artisan in Southport, then again in West Hartford. All are considered gems … and like Kieffer himself, understated. We were more than pleased by our dinner, the restaurant’s beguiling South of France décor and setting on the water, as well as its flawless professional service. Every aspect sparkled, literally in the best of taste. 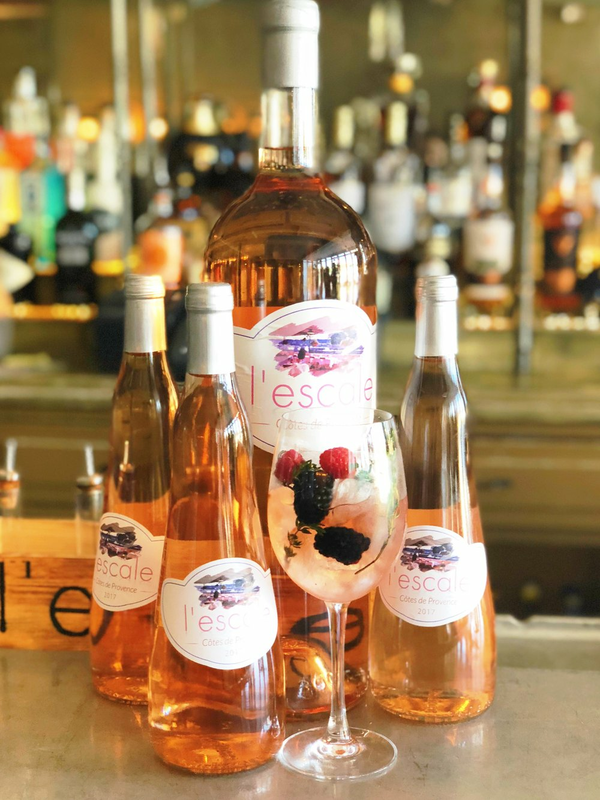 To start the summer dinner, maître d'hôtel Lily Martin recommended an elegant Côtes de Provence Rosé, the bottle brandishing l’Escale’s own label. The versatile pink wine sipped crisp, cool, and clean, pairing with every dish ordered, from delicate fish to raw steak. We began with an Angus Beef Carpaccio. The gossamer thin meat, easily lanced with the edge of our fork, was topped with organic arugula sourced from Gilbertites in Westport, shavings of a French Comté (rather than an Italian Parmesan), and dressed with a light, tangy caper sauce. The tender raw beef, brightened by a squirt of lemon, melted at first bite. Fresh, peppery greens, cheese and dressing elevated the dish into a light summer salad. A vibrant Tuna Tartare also danced the light fantastic. Crowned with stracciatella, the velvety texture of minced fish contrasted with crunchy radish discs and chopped cucumber. Chef Kieffer created depth of flavor and lush richness in his tartare without resorting to traditional avocado bits. Dayboat Scallops, seared to golden, caramelized perfection, rested on an array of wood-ear mushrooms, broccolini, cauliflower puree, and Hackleback caviar sauce. Redolent of land and sea, this savory bed lent even more layers to the “candy of the ocean.” The crusted, but creamy scallops tasted fresh, clean, and distinctly sweet. Clearly, the restaurant works with impeccable ingredients. Though certainly Greenwich-Upscale, l’Escale’s price points are not Manhattan expensive, even though the quality is very comparable. Case in point: Chicken Paillard, priced at 28 dollars. The kitchen pounded the breast meat pancake-thin, so after sautéing, the chicken blanketed the entire dinner plate. 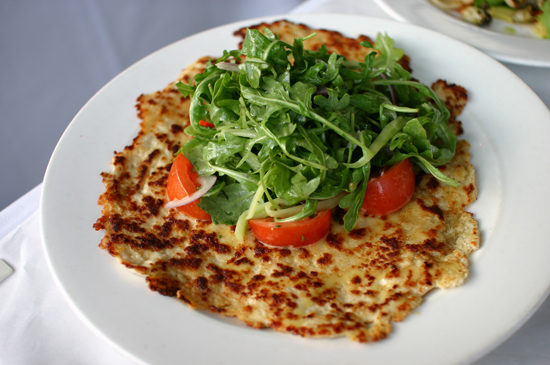 This canvas was adorned with a colorful mélange of tomato, fennel, cucumber, arugula, red onion and parmesan. Simple and classic, the Paillard has served as a house signature dish since Chef Kiefffer opened l’Escale back in 2003. When it comes to restaurant salmon, we always order rare, but rarely get it. At l’Escale we did. The Fjord Islands Salmon was presented with a robust sear, sealing a coral-red rare interior. French green lentils, brussels sprouts, and a Dijon mustard dressing attended the 1 ½ inch thick filet. Though rare, the flesh was lush and silky, and surprisingly aromatic and moist. A masterpiece. And then came the show stopper, an ethereal Chocolate Souffle, crafted by Pastry Chef Wendy Laurent, a Greenwich native trained at the CIA, in Belgium and New York. We pressed a pocket in the warm cake, poured in sweet pistachio cream, and then sampled a spoonful. What looked thick, rich and eggy to the eye, defied gravity on the palate. Warm sugar captured in mid-air, dissolved into chocolate and buttery notes so light they seemed without substance. No cuisine does pastry like the French. And few restaurants do desserts like l’Escale. Incidentally, the French name translates as “Port of Call.” Situated on the Greenwich Harbor, the restaurant’s menu and motifs are decidedly sea-side. An al fresco dining terrace overlooks the water, its nautical-white Vilebrequin umbrellas shading lunch diners and early evening cocktail sippers from a summer sun. Pure Provence. Reminder: that’s the Sound, not the Mediterranean off the deck. The restaurant seats nearly 250 inside and on the terrace. Though most of Connecticut may not be familiar with l’Escale, Greenwich and Rye diners know this jewel well and frequent it often. On the mid-week evening we dined, the place was packed, the vibe effervescent, and though most every seat was taken, the service hummed. Efficient waitstaff, bus boys, and captains made sure no one was waiting or wanting. The moment we finished a course the plates were quietly cleared, glasses refilled, crumbs removed. However, Chef Kieffer was not circulating the front of the house, working the room. He was working in the kitchen, his true home port.